It’s been a few weeks now since I finished reading Tombland, the seventh novel in C. J. Sansom’s Shardlake series. I wrote a Friday post, quoting the first paragraph and a teaser from page 56 and have been wondering what to write about the book as a whole. It is very long, is based on primary and secondary sources with notes and a bibliography. ‘Tombland‘ is an area within the city of Norwich and there’s a street plan on the endpapers of my hardback edition, showing the layout of Norwich and the position of Mousehole Heath in 1549. It is a most impressive book full of detail with a large cast of characters, and whatever I write will not do justice to it. It’s 1549, Edward VI is king, a minor and England is ruled by the Duke of Somerset as Lord Protector. Rebellion is spreading in protest against the landowners’ enclosures of the common land. Edward’s sister, the Lady Elizabeth has asked Matthew Shardlake to make discrete investigations into the murder of Edith Boleyn, the wife of John Boleyn – a distant Norfolk relation of Elizabeth’s mother, Anne Boleyn. John Boleyn has been arrested and will be on trial at the Norfolk Assizes. The murder mystery, however, is not the main focus of Tombland. Shardlake and his assistant, Nicholas Overton leave London for Norwich, begin their investigation, but as they leave Norwich they get caught up in a rebellion as thousands of peasants led by Robert Kett march on Norwich and establish a vast camp on Mousehole Heath on the land overlooking the city. I knew about the early enclosures of common land, but hadn’t heard of Kett’s Rebellion before. A large part of the book follows the sequence of events that made up the Rebellion (with more detail given in the Historical Essay at the end of the book). Shardlake is forced to join the rebels. He then has little control over events in the rebel camp and has to search his conscience to decide whether to help them and where his loyalties actually lie. His sympathies lie with the common people ousted from the land they had previously used and so, when Robert Kett asks for his advice at the trials held at the ancient oak, they called the ‘Oak of Reformation’ to ensure that the proper legal procedures are followed he agrees. Meanwhile Shardlake has not forgotten about Edith’s murder and as the rebels take over the city of Norwich for a while he is allowed to visit John Boleyn, held a prisoner in Norwich Castle, and convinced of John’s innocence he is determined to discover who really had murdered her. Surprisingly, he finds the key to the mystery back at the rebel camp. There is so much more to this book, skilfully written combining the historical facts and fiction. But it works well as a standalone book as enough information is given to understand the relationships of the characters from the earlier books. I was rather sad to see that Guy Malton (previously a monk and now licensed as a doctor), one of my favourite characters is now old and ill, but I was pleased to learn more about Jack Barak, Shardlake’s former assistant, and his on-off relationship with his wife Tamsin. Shardlake’s former servant, Josephine lives in Norwich and he is pleased to meet up with her, her husband and young baby. 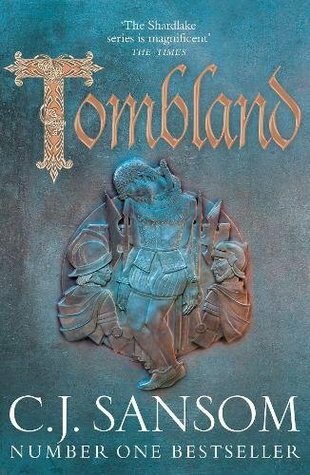 Tombland is a book with an emphasis on the people of the Tudor period – not just about royalty and national events. Protector Somerset is waging war against Scotland but that is only mentioned, Edward VI doesn’t appear, Mary, his sister is referred to, and Elizabeth, his other sister has a cameo role at her household in Hatfield Palace in Hertfordshire. With so much detail it has a slower pace than other books I’ve read recently but I loved the attention to detail and the descriptive writing which placed me precisely at the scenes. Very glad to hear you enjoyed this one, Margaret. Sansom really does do his research, and I find I always learn when I read one of his book. And somehow, he weaves that research in without dragging the book down (at least for me). That takes skill. I hope he continues with the series, writing about Mary and Elizabeth. I think my Shardlake period is over. I know these were not particularly good times in which to live, but there has been just so much misery, especially for Shardlake and those associated with him that I don’t feel I can read any more. I’m glad you enjoyed it, though. I know what you mean. In Tombland he is feeling his age! I can’t wait to read this and am looking forward to it even more after reading your review (I agree that it’s difficult to do justice to the Shardlake books, but you’ve done a great job here). I love the Tudor world Sansom creates – he really captures the feel and atmosphere of the 16th century and I always learn so much from his books. Thanks, Helen and I hope you’ll like it as much as I did – I learnt so much, especially as this one is mainly about the ordinary people and their struggle to survive. I’m reading the first book in the series and am really enjoying it! I think I’ve read three or four Shardlake books and always regret not getting back to them sooner. The thing is, they require serious committment and I’m not always in the mood for that kind of read. Your review of this one is excellent though, Margaret. Thanks Cath. It’s not often I read such long books these days – I’m not always in the mood either, but once I’d got into it I thought it was worth it. So glad you enjoyed this one too! It’s the fact that he makes the people so believable that lifts them above the usual run of historical fiction – they feel just like us without being in any way anachronistic to their own time, if you know what I mean. That, and the brilliantly researched historical setting. I was sorry Guy wasn’t in it much too, but I do like that Sansom’s realistic about people aging, and even dying. I agree, FF – and actually I thought there were some parallel situations with today, with the poor struggling to support themselves etc.